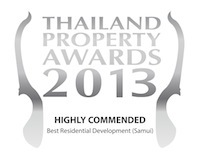 Mandalay Samui Developments is very pleased and proud to announce winning the prestigious “Highly Commended Best Residential Development (Samui)” award at Thailand Property Awards 2013 for its Mandalay Beach Villas project. Leading figures from Thailand’s property industry came together at the Thailand Property Awards 2013 gala dinner and awards presentation ceremony, held at the Centara Grand & Bangkok Convention Center at CentralWorld on September 19, 2013. The Thailand Property Awards celebrate the best of the best and offer an unrivalled showcase of Thailand’s residential real estate industry. Now in their eighth year, the awards assist in promoting the high level of quality in Thailand’s real estate, construction, architectural and interior design sectors, as well as the professional services on offer in the Kingdom. The professionally run awards have put Thailand’s real estate industry on the world stage and begin with nominations by the public and the industry, followed by entry submissions and judging by a panel of professionals, including site visits for the top-short listed developments in each category. Nominees for Thailand Property Awards go through a tough and gruelling process with only one overall winner awarded in each category. “The quality of nominations and entries this year was exceptional and shows the growth and diversity inThailand’s robust real estate industry,” - said Terry Blackburn, CEO, Ensign Media Co., Ltd, organizers of the awards. “We are absolutely delighted, and honoured to receive this award, it’s a fantastic recognition that we are continuing to head in the right direction. This achievement is a result of an amazing team work.” - said Tibor Szedlak, Founder, Managing Director, Mandalay Samui Developments, developers of Mandalay Beach Villas. The philosophy of Mandalay Beach Villas is crisp, clear and simple. Against a backdrop of unerring modern style and sophistication, we exist to create an unforgettable contemporary tropical experience for you. Beyond the design-led, classy environs, our team members are on a personal mission to create an impressive balance between form and function, inside and out, modern and tropical. Mandalay Beach Villas is a collection of luxury beachfront pool villas in contemporary modern design. The secure and gated luxury estate offers the ultimate in island accommodation, matching exclusivity with privacy. Facing the white sandy expanse of Laem Noi Beach, and backed by lush palm stands, each of the exclusive villas has its own private courtyard, giving approximately 350-500 square meters of living space, with 17-35m beach frontage each, on land plots ranging from 800 to 1600 square meters. Each Client has the option to participate in a Rental Management Program, that has been created for all those who wish to own their property as a form of a lifestyle & investment product.